SUNNYVALE, Calif.--(BUSINESS WIRE)--Quiet Solution, the market and technology leader in soundproof drywall, today announced its new QuietPad 420 floor underlayment for impact noise reduction in high-rise concrete construction. The new product provides superior performance to other popular rubber and cork underlayments at significantly lower cost. The highly-engineered underlayment delivers IIC ratings up to 61 – a very high reduction in the amount of ‘impact’ noise heard in units below. The new QuietPad is only 1/16” thick, is affixed directly to the concrete subfloor and allows attachment of wood or tile directly on top, without an extra layer in-between. The thin underlayment replaces competitive products that are often ¼” thick or more, providing a large advantage to builders that want to make best use of every inch. QuietPad has a Robinson floor test rating of light commercial, and is designed for wood or tile flooring. The product is particularly well-suited to hotel and high-rise condominium and office construction. 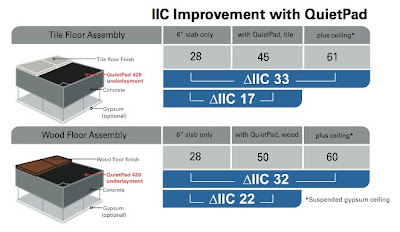 The company also recently announced details of a UL-rated floor/ceiling assembly for wood frame construction, using QuietRock, QuietWood and QuietFoam floor underlayment. QuietPad is available now from over 1,000 authorized dealers in rolls that are 5 feet wide by 300, 600 or 1,200 feet long. Quiet Solution, a division of Serious Materials, is America’s most trusted manufacturer of soundproofing products. As a technology leader, it provides world-class commercial and residential building materials that support sustainable construction while enhancing quality of life. Patented and patent-pending products and technologies include QuietRock® soundproof drywall, QuietWood® and QuietHome® high-STC windows and doors. These provide the lowest total cost soundproofing solutions for builders, architects and owners, easily and reliably. The company’s environmentally friendly products are manufactured in the United States and are available at authorized dealers throughout the U.S. and Canada. For more information, visit http://www.QuietSolution.com or http://www.SeriousMaterials.com.